The easiest way to track your favorite TV shows is usually to download a suitable app, or maybe sign up at a website. There are a huge number of options, and the only real challenge is finding out which one is best for you. But what if you’d like a solution that works offline? One that doesn’t involve opening yet another account somewhere, and runs happily on the Windows desktop? Then you need to check out epCheck. The program is a compact 858KB download, portable and entirely adware-free. Just unzip it, run epCheck.exe and it’s ready to go immediately. Getting started is as easy as entering the name of your favourite TV shows. 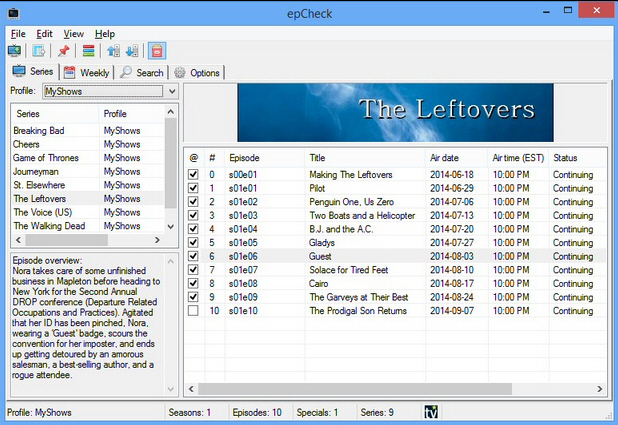 EpCheck grabs and displays all its data from TheTVDB.com, including every episode name, overview, air time and network. These episode details can then be browsed in a Series view, great for bringing back memories of classic TV moments. Individual episodes can be marked as "watched", too, highlighting anything you might have missed. Clicking the "Weekly" tab shows yesterday’s, today’s and upcoming broadcasts for all your stored series, great for planning your viewing. There’s simple web integration. Right-clicking any episode displays options allowing you to search for that episode online; double-clicking a show opens its page at TheTVDB.com. This is all surprisingly configurable, too. Would you like the program to open with a different tab, display more future days in the Week view, use different fonts, close with the Esc key? Click the Options tab and start tweaking. EpCheck won’t be for everyone, but it’s a likable tool, lightweight, portable and easy to use. If you’re looking for offline TV tracking then we’d give it a try.